Explore the off road in style with this all terrain tackling experience! Drive a 4x4 and quad bike through the woodlands then race the high speed apache rally car! This action packed half day of off road activities in Kent is a great way to explore some of the different types of off road vehicles. First you will try your hand on the trusty Quad Bike as you are lead through over 200 acres of orchards, woodlands and fields by the expert instructor. You will have to negotiate a variety of difficult terrain as you make your way around the grounds, including hills, slopes, dips and gullies! Next, you will take it in turns behind the wheel of an extremely capable 4x4 back out in the grounds, exploring the full capabilities of this superb off roader. Finally, you will get to drive the awesome Apache Rally car and drift it around the grass track! Great fun guaranteed - the drive home won't be the same!You will start this magnificent off road experience with a session of theory, demonstrating an and insight into the capabilities of the quad bikes. You will then undertake a highly enjoyable period of ability and safety assessment before jumping on your own quad bike to explore the extensive grounds. When it is time for the 4x4 an instructor will be around to show you how it's done and then it's your turn to take the wheel! (A maximum of 3 people will share the 4x4 vehicle). You will also have an instructor with you inside the Apache off road rally car. This experience is available most Saturdays throughout the year and occassional weekdays on special request. Alternative days can be arranged for larger group sizes. If you are particularly tall or short, or feel that your physique may impair your enjoyment of this activity in any way, please check with the centre when booking. Please allow 3 to 3.5 hours for this experience and arrive at least 15 minutes before your start time. Each participant will have their own quad bike. Apache Rally is shared with up to three other people and the 4x4 driving is shared with up to two other drivers. Everyone should get around one hour on the quad bikes which includes a safety briefing. You will get around 10 to 15 minutes in both the 4x4 and Apache after having a safety briefing. Participants: The Quad Bike, Apache Rally and 4x4 Experience - Kent is for 1 participant. You will be sharing this activity with up to three other people. Spectators are welcome - however, viewing may be limited for certain activities. There is a pleasant indoor meeting space where refreshments are available. The centre will provide all safety equipment needed, but please wear comfortable casual clothing and trainers that you don’t mind getting dirty. In wet weather a change of clothes is advisable. In adverse weather conditions the centre reserves the right to substitute the Apache Rally Car with an alternative motorised activity. Spent the afternoon with these guys and had a great time. 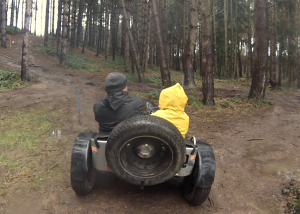 Plenty of time riding & driving the cars and quad bike. One of the best I have ever done. Would definitely recommend it. Thanks guys. I had an absolutely cracking time on my experience, definitely one of the best things I've done. The instructors were brilliant, just the right amount of tuition without being overly cautious. The quad biking circuit was brilliant, and drifting round the field (or trying to!) in the Apache Rally car was outrageous fun. Then to top it off we drove landrovers at seemingly impossible angles through the woods. All in all a top day that I'd recommend to anyone. Thanks! Whilst we all enjoyed the day, we didn't do the 4x4 driving as we had expected (this was substituted with trail cars). 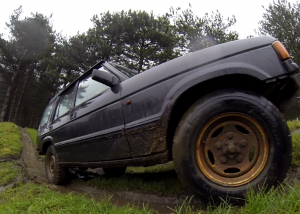 We decided to kick-start our new year, with an office off-roading day out! We crawled out of bed and set off eagerly for a day of off-roading adventures with The Wright Event, in Kent. Pulling into the private drive-way, we could see that there would be no shortage of mud! We were greeted and welcomed to the centre, via a cosy reception area – with a wood burning stove, perfect for the chilly, wet weather – before the instructors outlined the day ahead. We would be taking part in 3 activities: Quad-biking, 4×4 driving, and Sporting Trials. 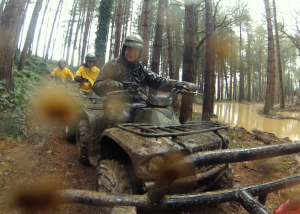 Once kitted out from head to toe in some much-needed waterproofs, we headed out to the Quads for an instructional briefing and introduction to the vehicles. Climbing aboard, we set off – some with a little more trepidation than others – for a quick practice around the obstacle field, before heading into the orchard, and then into the 4×4 off-road driving area. Lead by an instructor, we covered a wide range of terrain, climbing and descending mud covered slopes, and splashing our way through some demanding ruts and ditches. Needless to say, the sheer amount of mud made the experience very eventful and there was no lack of entertainment when one of our team members decided to take a few detours into trees and ditches! We all learnt a lot, and soon got to grips with our vehicles, enjoying ourselves immensely. Then we moved on to the 4×4 driving. The fact that there were only 2 qualified drivers in our number was not a problem at all, as the session was modified throughout to cater for all of our abilities – from first time drivers, to those who had some previous off-roading experience. The qualified and highly experienced instructors were very patient, and encouraged all of us to have a go, taking us outside of our usual comfort zones. I personally was surprised at the extreme capabilities of the all-terrain vehicles. The day came to a close with the Sporting Trials. The idea was to get the Trials car up some very steep slopes, and negotiate the tight, hairpin corners of the marked route, without stopping or knocking down the markers. With the amount of rain, the task seemed impossible, but the natural ability of the car soon had us all grinning from ear to ear, as we slid and skidded our way around the course. Throughout the day, all of the instructors were not only knowledgeable and experienced, but also very patient and friendly. The centre welcomes bookings of groups and individuals across a wide range of ages and as most of the equipment is dual-control, those with no experience, including juniors (over 11 years or a minimum of 1.4m tall) are welcomed… we would highly recommend this for a thrilling day out! Will a drivers licence be required for the Quad Bike, Apache and 4x4 Experience? No Drivers licence is required for this experience. How much drive time do you get with the Quad Bike, Apache Rally and 4x4 Experience - Kent? You get an hour on the quads which will also include a safety briefing and 10 to 15 minutes with the 4x4 and Apache.